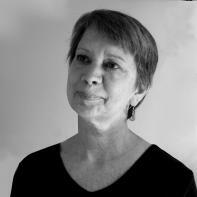 Mercedes Lawry has published poetry in such journals as Poetry, Rhino, Nimrod, Poetry East, Seattle Review, and others. She's also published fiction and humor as well as stories and poems for children. Among the honors she's received are awards from the Seattle Arts Commission, Hugo House, and Artist Trust. She's been a Jack Straw Writer, held a residency at Hedgebrook and is a Pushcart Prize nominee. Her chapbook, There are Crows in My Blood was published by Pudding House Press in 2007 and another chapbook, Happy Darkness was released by Finishing Line Press in 2011. She lives in Seattle. was the lessening of peripheral vision. and what do you see? Your nose. With both eyes open, the nose disappears. I learn this in an essay by Lawrence Wechsler. in hallways and spies spilling out of secret doors. so we understand he was no slouch at ruse and deception. had the bridge of his nose shaved off. a diminished snout would enhance his chances. With an angular profile, he lived a long, if bloody, life. listless May and blowsy roses. to green, the sea's sad echo. of gentlemen. The meeting was called to order. outside the room, disguised or otherwise. No accounting for taste on a Tuesday evening. Hope became rain and then a sliver moon. unable to carry the burden. this particular night to die? Ah, civic duty isn't what it used to be. that it didn't matter whether someone waited at home. The others opened their arms. whether winged or rooted, still human.